Of all of my paintings, none have the title of Creative Thursday, this is the first. If I were to translate through paint what Creative Thursday feels like to me, this is it. (And for something different, in honor of a special painter out there, I painted this with my left hand instead of my right). Thanks again to everyone who shared their work with me today and if you come up with something in the final hours of this Creative Thursday, let me know! *Edit* Friday, September 29 ~ I have listed it as a print over at the Etsy Shop. And, I'll be back later with more Creative Thursday creations to share! Ok, this owl is gorgeous and so peaceful. I LOVE him!! Thank you for sharing your snowy owl Annie! You can read more about him right here. Debbie just sent over the first creation for today's Creative Thursday. It's beautiful and I absolutely love the sentiment. To read more about it, click here. I'm very touched that this little creative movement is inspiring you all to create. Thank you so much for sharing your work with me, with us!! I'm getting excited for Halloween already! I know it's still September, but October is next week and I can't resist. In honor of my impatience/excitement of the season I have listed one of my favorite daily paintings from 2006 as a print over at Etsy just for the month of October. This is a small print, 5.5" x 5.5" for $18. You can find him right here. I'll be right back to share with you the first Creative Thursday creation!! Tomorrow is CREATIVE THURSDAY for YOU! 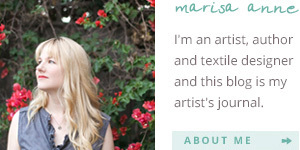 I hope you'll join me for a Creative Thursday tomorrow! If you've been looking for an excuse to be creative, tomorrow's the day. This painting, "Sundance" was my very first piece that I created when I made my "return" to a life as an artist. It is very special to me, a symbol of where I was headed and where I've now landed. All I did is lay a tarp out on my bed, (yes, my bed, not some fancy studio, not even a desk) and start painting one day...and it hasn't stopped since. So, don't think about it too much ~ just make something fun, anything, anything that makes you happy and if you feel like sharing it with me, I'd love to see it! Alrighty then! Lots of exciting things here at Creative Thursday!! And due to a continuing stream of commissions, upcoming projects for the holidays, and another show this time in New York in December, I will be releasing all of the newest daily paintings (after today) in October, as I did for the month of September. And as before, I'll be sure to give you sneak peeks of some of the paintings before the sale. Until then here's a polar bear for you to enjoy. 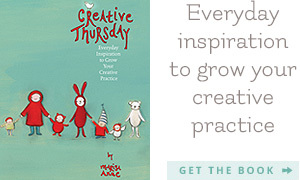 psst....Don't forget that this Thursday September 27th is Creative Thursday for everyone to be creative!!!!!!! And just like that, summer turned to fall. All day yesterday, we anxiously awaited our "Los Angeles" version of a storm (and yes, I know those of you living in much harsher weather climates will laugh at me now). But, when you haven't seen a drop of rain in what feels like an eternity, (8 months maybe? ), a tiny terrential down pour is very EXCITING!!! Late last night the rains came, even a little a bit of lightning and the cool weather followed. So hard to believe that we were just in that crazy heat wave 3 weeks ago. I guess that's why we call it "seasons changing". For any number of reasons, probably because I'm mostly loving my life these days ~ I really get into the everything, especially this whole "seasons changing" situation. I used to miss the little day to day things around me, in favor of more "exciting" things, but not anymore. Now you cannot believe how excited I was to have our first fire in the fire place last night (thank you Sean) to make chicken noodle soup, to wear a sweater and jeans, and to be making chili tomorrow. Does this mean I've officially become a domestic goddess and/or that I LOVE food. Probably so. And just like that I traded my flip flops in for my UGGs. I hope you're having a nice fall weekend wherever you are. ps ~ thanks so much for all the comments and emails about "jessica"...I will be doing more in that style. In keeping with this random theme for this week. Meet one of my favorite "realistic" style artists, Justin Clayton (also introduced in one of my very first podcasts). A fellow daily painter, in fact the very one that inspired me to daily paint (many thanks Justin!! ), Justin is recording his 20 day trip with daily paintings as he travels down the coast of California. He is now officially 10 days in and also has a beach paintings blog where you can follow along. Justin is yet another shining example of an artist making a living doing what they love. After being laid off from his job, he too was inspired by the "daily painting" movement, and in January of 2006 made a New Year's resolution to create a painting a day. Nearly two years later, he's still at it and each piece he creates is a special one. All this talk about "realistic" style painting and I thought I would challenge myself, do something TOTALLY different, and paint a person in a more realistic style. It was so fun, and a tiny bit scary, because as I said before, I'm not much of a portrait-type girl. What was interesting with this painting, was finding the balance between "copying" the photograph exactly and letting the style that I've developed re-emerge back into the piece, which on some level created a slightly different personality. I don't know if that makes sense, but I'm really happy with how it turned out. I've decided to post it right after the photograph that inspired it. click here to buy original.